With Doodle’s free online calendar, you can create an online calendar quickly and easily. Create any number of meetings and invite your colleagues or friends to agree on times that also suit their schedules. With a clear and concise calendar view, you can take control of your busy schedule. Doodle is the perfect tool for organization and planning. Sharing your online calendar is also extremely easy. Doodle’s simple invitation system either provides poll links for you to send through standard email or, allows you to compile email addresses through the convenient Doodle interface. This means that you and your colleagues will be better connected and enjoy greater efficiency regardless of your location or restricted communication. You can start your own online calendar here. Fill in the title of your meeting, the location and any notes you may have. Select times for your meeting from the week view or the month view. It’s best to choose a few options to increase the likelihood that you can find a time for everyone. You can also choose text if you’d like to create a free text poll and collect votes on anything you like. On the settings page, you can add options like ‘yes, no, if-need-be’, limit the number of votes per option, or hidden poll. There are many more options for Doodle Premium users. Enter your email address and send out your meeting invitations to your clients, colleagues, or your team. Sit back and let everyone vote on options for the meeting. In minutes (or seconds) you’ve found the time that’s best for everyone. Doodle is also a great choice for users who already use calendar software to organize their business or personal life. 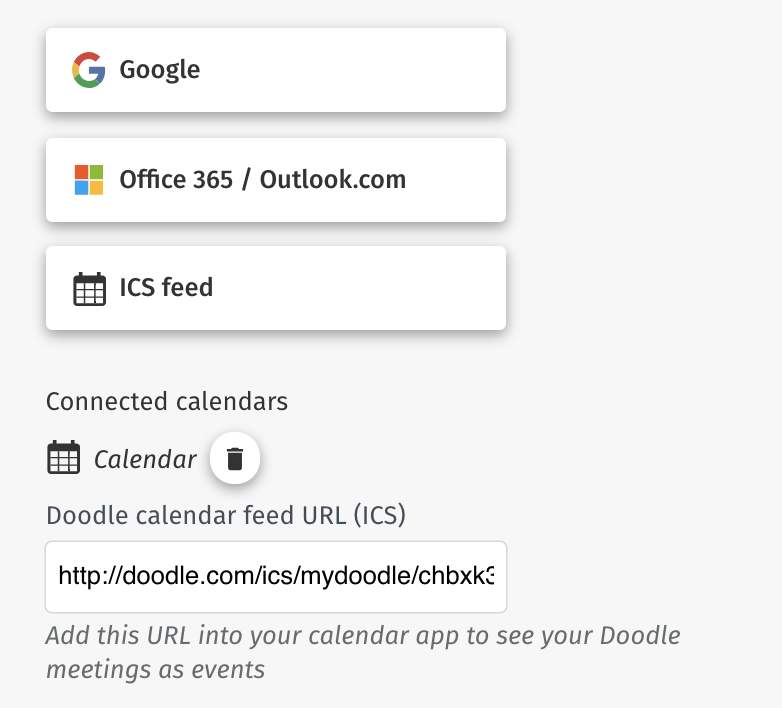 With free support for popular calendar applications such as Google Calendars, Office 365, Outlook and iCal, Doodle’s online calendar integrates seamlessly for increased productivity and greater transparency when trying to organize meetings. This means that enjoying the benefits of Doodle’s free online calendar remains remarkably simple and unobtrusive – regardless of your current scheduling systems. 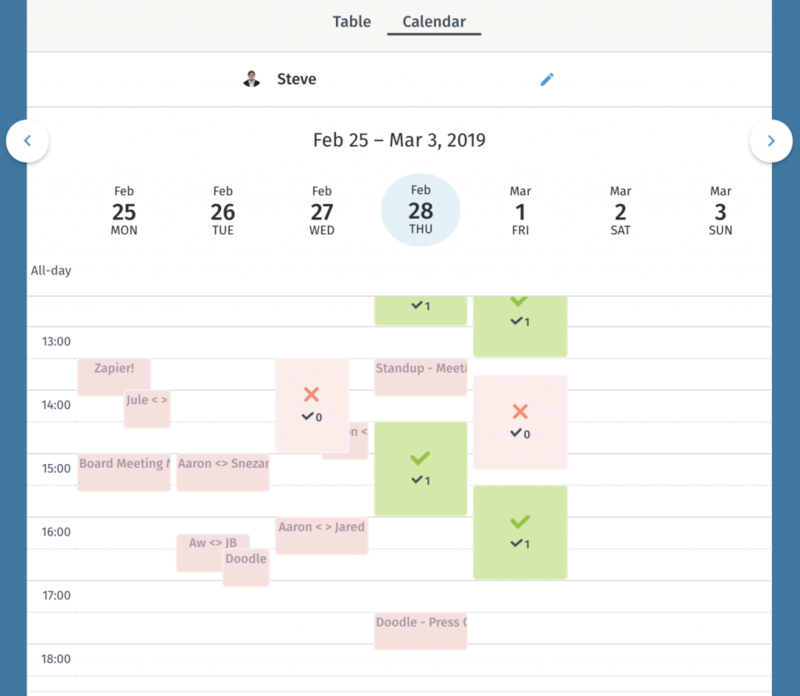 Doodle Premium gives users many extra features not available with other, free online calendars and is perfect for busy professionals who want comprehensive control over their scheduling. Completely ad-free, Doodle Premium also allows you to include custom design and branding to help get create a professional look. You can also see who’s missing from your invites and who’s read your emails! Alongside online calendar sharing and address books, Doodle Premium also gives users the opportunity to create a MeetMe page that allows other users to view your availability at any given time. MeetMe serves as a central contact page so colleagues or friends can see an overview of how and when you can be contacted. It’s perfect for those with excessively busy schedules and little time for a chat.